When is my wedding ? Originally devised as a marketing tool to promote Weddings By Adam i began to realise it had potential on its own. Its an area called “Wedding Tickers”. 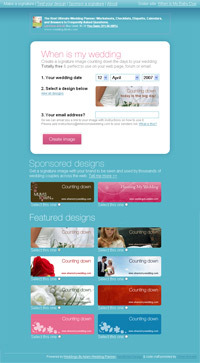 You can go to the site, input your wedding date and it gives you back a (beautifully designed of course!) banner image with an updating countdown to your wedding date. You can then use that in your forum signature, blog, Myspace page or even email. The viral aspects of it are huge so we have opened it up to advertisers who can upload their own ad/ wedding ticker and the site provides the distribution infrastructure. It is a simple idea and a simple useful application which marks our first foray into the world of Ruby on Rails. I had been talking to rails developer Olivier Ansaldi for a while and we had been looking for an opportunity to work on something and this seemed ideal. I am sure he wont mind me pimping him so if you are ever looking for a ROR developer i cant recommend Olivier highly enough. Dublin based so easy to meet up with, fast and constant with the communication and asked all the right questions. And the site works so i cant say better then that. As for Rails i was amazed at the speed of development and its something i will look at for our next project.